شیخی فرد, زهرا, رنجبر, مهدی, سلامتی, هادی, فرخ پور, حسین. (1394). تاثیر زمان ماندگاری بر خواص اپتیکی نانوذرات هسته-پوسته Au/Pd ساخته شده به روش کندوسوز لیزر پالسی. 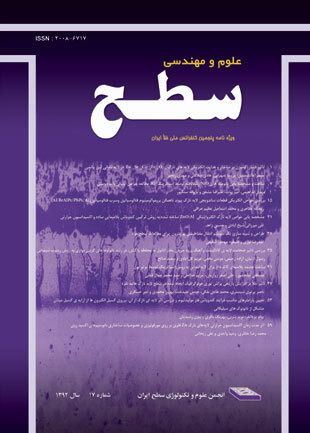 نشریه علوم و مهندسی سطح, 11(26), 23-33. زهرا شیخی فرد; مهدی رنجبر; هادی سلامتی; حسین فرخ پور. "تاثیر زمان ماندگاری بر خواص اپتیکی نانوذرات هسته-پوسته Au/Pd ساخته شده به روش کندوسوز لیزر پالسی". نشریه علوم و مهندسی سطح, 11, 26, 1394, 23-33. شیخی فرد, زهرا, رنجبر, مهدی, سلامتی, هادی, فرخ پور, حسین. (1394). 'تاثیر زمان ماندگاری بر خواص اپتیکی نانوذرات هسته-پوسته Au/Pd ساخته شده به روش کندوسوز لیزر پالسی', نشریه علوم و مهندسی سطح, 11(26), pp. 23-33. شیخی فرد, زهرا, رنجبر, مهدی, سلامتی, هادی, فرخ پور, حسین. تاثیر زمان ماندگاری بر خواص اپتیکی نانوذرات هسته-پوسته Au/Pd ساخته شده به روش کندوسوز لیزر پالسی. نشریه علوم و مهندسی سطح, 1394; 11(26): 23-33. مدهای پلاسمونی فعال در نانوذرات فلز نجیب همچون طلا کاربردهای زیادی در زمینه‌های مختلف اپتیکی برای آنها رقم زده است. از آنجا که عوامل مختلفی مانند شکل، اندازه و ثابت دی الکتریک محیط بر خواص اپتیکی آنها تاثیرگذار است مطالعه ویژگی‌های این مد از اهمیت ویژه‌ای برخوردار است. در این پژوهش نانوذرات هسته-پوسته به کمک فرایند کندوسوز لیزری (لیزر پالسی Nd:YAG، طول موج nm 1064) در محلول PdCl2 ساخته شدند. ساختار کریستالی نمونه‌های به دست آمده توسط الگوی پراش پرتو ایکس (XRD) تعیین گردید. همچنین از اسپکتروسکوپی فوتوالکترون‌های پرتو ایکس (XPS) برای تعیین ترکیب شیمیایی سطح نانوذرات و نوع پیوندهای تشکیل شده استفاده گردید. شکل، اندازه و ضخامت پوسته در نانوذرات هسته-پوسته توسط تصاویر TEM مشاهد شد. الگوی پراش پرتو ایکس تشکیل فازهای بلوری Au، PdCl2 و PdO را نشان داد. اثر گذشت زمان برطیف‌های جذب با استفاده از تحول زمانی طیف‌های جذب پلاسمونی گرفته شده با استفاده از طیف سنجی UV-Vis مطالعه شد. در نهایت برای پدیده‌های مشاهده شده توصیفات فیزیکی ارایه گردید. 1. G. Cristoforetti, E. Pitzalis, R. Spiniello, R. Ishak, M. Muniz-Miranda, Production of palladium nanoparticles by pulsed laser ablation in water and their characterization, Physical Chemistry C, 115 (2010) 5073-5083. 2. M. Mandal, S. Kundu, S. K. Ghosh, T. Pal, Micelle-mediated UV-photoactivation route for the evolution of Pdcore-Aushell and Pdcore-Agshell bimetallics from photogenerated Pdnanoparticles, photochemistry and photobiology. A, Chemistry, 167 (2004) 17-22. 3. N. Toshima, Core/shell-structured bimetallic nanocluster catalysts for visible-light-induced electron transfer, Pure and applied chemistry, 72 (2000) 317-325. 4. E. Solati, M. Mashayekh, D. Dorranian, Effects of laser pulse wavelength and laser fluence on the characteristics of silver nanoparticle generated by laser ablation, Applied Physics A, 112 (2013) 689-694. 5. M. Mirdamadi-Esfahani, M. Mostafavi, B. Keita, L. Nadjo, P. Kooyman, H. Remita, Bimetallic Au-Pt nanoparticles synthesized by radiolysis: Application in electro-catalysis, Gold Bulletin, 43 (2010) 49-56. 6. W. Annan, P. Qing, L. Yadong, Rod-Shaped Au–Pd Core–Shell Nanostructures, Chemistry of Materials, 23 (2011) 3217-3222. 7. Y. W. Lee, M. Kim, Z. H. Kim, S.W. Han, One-step synthesis of Au@ Pd core− shell nanooctahedron, American Chemical Society, 131 (2009) 17036-17037. 8. V. Abdelsayed, G. Glaspell, M. Nguyen, J. M. Howe, M. S. El-Shall, Laser synthesis of bimetallic nanoalloys in the vapor and liquid phases and the magnetic properties of PdM and PtM nanoparticles (M= Fe, Co and Ni), Faraday discussions, 138 (2008) 163-180. 9. D. Ferrer, A. Torres-Castro, X. Gao, S. Sepulveda-Guzman, U. Ortiz-Mendez, M. Jose-Yacaman, Three-layer core/shell structure in Au-Pd bimetallic nanoparticles, Nano letters, 7 (2007) 1701-1705. 10. S. Devarajan, P. Bera, S. Sampath, Bimetallic nanoparticles: a single step synthesis, stabilization, and characterization of Au–Ag, Au–Pd, and Au–Pt in sol–gel derived silicates, colloid and interface science, 290 (2005) 117-129. 11. Y.-H. Chen, Y.-H. Tseng, C.-S. Yeh, Laser-induced alloying Au–Pd and Ag–Pd colloidal mixtures: the formation of dispersed Au/Pd and Ag/Pd nanoparticles, Materials Chemistry, 12 (2002) 1419-1422. 12. V. Rivera, F. Ferri, E. Marega Jr, Localized Surface Plasmon Resonances: Noble Metal Nanoparticle Interaction with Rare-Earth Ions, (2012). 13.C. Hsu, C. Huang, Y. Hao, F. Liu, Au/Pd core-shell nanoparticles with varied hollow Au cores for enhanced formic acid oxidation, Nanoscale research letters, 8 (2013) 1-7. 14. F. Liu, D. Wechsler, P. Zhang, Alloy-structure-dependent electronic behavior and surface properties of Au–Pd nanoparticles, Chemical Physics Letters, 461 (2008) 254-259. 15. T. Akita, T. Hiroki, S. Tanaka, T. Kojima, M. Kohyama, A. Iwase, F. Hori, Analytical TEM observation of Au–Pd nanoparticles prepared by sonochemical method, Catalysis Today, 131 (2008) 90-97. 16. H. Remita, A. Etcheberry, J. Belloni, Dose rate effect on bimetallic gold-palladium cluster structure, Physical Chemistry B, 107 (2003) 31-36. 17. Z. Suo, C. Ma, M. Jin, T. He, L. An, The active phase of Au–Pd/Al2O3for CO oxidation, Catalysis Communications, 9 (2008) 2187-2190. 18. V. Amendola, S. Scaramuzza, S. Agnoli, S. Polizzi, M. Meneghetti, Strong dependence of surface plasmon resonance and surface enhanced Raman scattering on the composition of Au–Fe nanoalloys, Nanoscale, 6 (2014) 1423-1433. 19. V. Amendola, M. Meneghetti, O.M. Bakr, P. Riello, S. Polizzi, D.H. Anjum, S. Fiameni, P. Arosio, T. Orlando, C. de Julian Fernandez, Coexistence of plasmonic and magnetic properties in Au 89 Fe 11 nanoalloys, Nanoscale, 5 (2013) 5611-5619. 20. M. L. Tseng, Y. W. Huang, M. K. Hsiao, H.W. Huang, H.M. Chen, Y.L. Chen, C.H. Chu, N.-N. Chu, Y.J. He, C.M. Chang, Fast fabrication of a Ag nanostructure substrate using the femtosecond laser for broad-band and tunable plasmonic enhancement, ACS nano, 6 (2012) 5190-5197. 21. V. Amendola, M. Meneghetti, Laser ablation synthesis in solution and size manipulation of noble metal nanoparticles, Physical chemistry chemical physics, 11 (2009) 3805-3821. 22. C. H. Bae, S.H. Nam, S.M. Park, Formation of silver nanoparticles by laser ablation of a silver target in NaCl solution, Applied Surface Science, 197 (2002) 628-634. 23. A. A. Ashkarran, A. Bayat, Surface plasmon resonance of metal nanostructures as a complementary technique for microscopic size measurement, International Nano Letters, 3 (2013) 50. 24. E. Ringe, J. Zhang, M.R. Langille, K. Sohn, C. Cobley, L. Au, Y. Xia, C.A. Mirkin, J. Huang, L.D. Marks, Effect of Size, Shape, Composition, and Support Film on Localized Surface Plasmon Resonance Frequency: A Single Particle Approach Applied to Silver Bipyramids and Gold and Silver Nanocubes, in: MRS Proceedings, Cambridge Univ Press, 2009, pp. 1208-O1210-1202. 25. M. Darroudi, M. Ahmad, R. Zamiri, A. Abdullah, N. Ibrahim, A. Sadrolhosseini, Time-dependent preparation of gelatin-stabilized silver nanoparticles by pulsed Nd: YAG laser, Solid State Sciences, 13 (2011) 520-524. 26. A. Simakin, V. Voronov, G. Shafeev, R. Brayner, F. Bozon-Verduraz, Nanodisks of Au and Ag produced by laser ablation in liquid environment, Chemical physics letters, 348 (2001) 182-186. 27. S. Dolgaev, A. Simakin, V. Voronov, G. Shafeev, F. Bozon-Verduraz, Nanoparticles produced by laser ablation of solids in liquid environment, Applied Surface Science, 186 (2002) 546-551. 28. G. Compagnini, A. Scalisi, O. Puglisi, Production of gold nanoparticlesby laser ablation in liquid alkanes, applied physics, 94 (2003) 7874-7877. 29. M. Hosseini, T. Barakat, R. Cousin, A. Aboukaïs, B.-L. Su, G. De Weireld, S. Siffert, Catalytic performance of core–shell and alloy Pd–Au nanoparticles for total oxidation of VOC: The effect of metal deposition, Applied Catalysis B: Environmental, 111 (2012) 218-224. 30. M. Maciulevičius, A. Vinčiūnas, M. Brikas, A. Butsen, N. Tarasenka, N. Tarasenko, G. Račiukaitis, Pulsed-laser generation of gold nanoparticles with on-line surface plasmon resonance detection, Applied Physics A, 111 (2013) 289-295. 31. N. Mirghassemzadeh, M. Ghamkhari, D. Dorranian, Dependence of Laser Ablation Produced Gold Nanoparticles Characteristics on the Fluence of Laser Pulse, Soft Nanoscience Letters, 3 (2013) 101. 32. J. Liao, Y. Zhang, W. Yu, L. Xu, C. Ge, J. Liu, N. Gu, Linear aggregation of gold nanoparticles in ethanol, Colloids and Surfaces A: Physicochemical and Engineering Aspects, 223 (2003) 177-183. 33. J.-H. Kim, H.-W. Chung, T.R. Lee, Preparation and characterization of palladium shells with gold and silica cores, Chemistry of materials, 18 (2006) 4115-4120. 34. S. Mandal, A.B. Mandale, M. Sastry, Keggin ion-mediated synthesis of aqueous phase-pure Au@ Pd and Au@ Pt core–shell nanoparticles, Materials Chemistry, 14 (2004) 2868-2871.